Anas bin Maalik ibn Nadar al-Khazraji Al-Ansari (Arabic: أنس بن مالك الخزرجي الأنصاري‎, Birth CE612-CE712,or died 709 was a well-known sahabi (companion) of Rasulullah SAW. Anas ibn Malik was born 10 years before the Hijrah of Rasulullah SAW to the Bani Khazraj tribe of Madinah. He was present in Madinah during Rasulullah’s time there and afterwards. He was the longest lived of the Companions of Rasulullah SAW, having died 93 years after the Hijrah (about: 711 CE).Or Anas ibn Malik, was the last of the sahaba to die at al-Basrah in 93 AH aged 103. Anas bin Malik RA was an Ansar of the Banu Khazraj[. He is not to be confused with Malik ibn Anas RA. Anas Ibn Malik, he was born in Madinah or Yathrib known during the time of Jahilliyah, on the 8th Before Hijri. His full name is Anas bin Malik bin an-Nadhar bin Dhomdhom al Anshory al Khazrojy.Commonly called Abu Hamzah, also was given the title Khodim ar Rasul ( Helper of Rasulullah SAW). By his mother Ummu Sulaim, Anas handed over to Rasulullah when Rasulullah SAW comes; hijrah (migrated) from Makkah. Anas’s father had opposed his wife's (Ummu Sulaim) converted to Islam. But opposition from the father of Anas had not to impede Ummu Sulaim step. Not how long, the father of Anas involved a dispute with someone so that finally killed. And Anas had become an orphan. At the time when Rasulullah SAW hijrah (migrated) from Makkah, Anas and his mother looks very happy. The people of Madinah welcomed the arrival of Rasulullah SAW with droves. Many of those who gave a gift to h Anas ibn Malik, was the last of the Sahabah to die at al-Basra in 93 AH aged 103 and Ummu Sulaim saw all of these events with a sense of joy. At the time of arrived a turn Ummu Sulaim had the opportunity meet with Rasulullah, Ummu Sulaim said, "O Rasulullah , the people of Ansar of both men and women have given the reward to your majesty. But I don't have something as a gift to your majesty, except my son. Therefore take him, so submissive to you to help what you want.” Rasulullah SAW was receiving with pleasure. Since then, Anas who were aged 10 years living with the family of Rasulullah SAW. In the household of Rasulullah SAW that's Anas RA learning and catch sublimity of Rasulullah SAW Behavior. Anas RA witnessed and interact directly with him. Observed all behaviors and attitudes of the Rasulullah SAW and then practiced on by him. Abu Hurairah RA, said, "I never saw person who resembles prayer of Rasulullah SAW except at ibn Ummu Sulaim – Anas’s, mother. In addition, ibn Sirin RA said, "Anas bin Malik RA is companions of Rasulullah SAW most excellent prayers, either in the house as well as in the time of Safar." Anas bin Malik RA witnessed firsthand just how noble morals of Rasulullah SAW in everyday life. Anas bin Malik RA has said, "I follow Rasulullah SAW during his ten-year-old never though he said: "why did you create that way? ", if I do something. If I didn't do a thing, Rasulullah SAW never said: "Why don't you do it?" Anas bin Malik RA also once tells stories, "One day Rasulullah SAW tell me for such a purpose. I was out of Home. And on the streets I met children who were playing. I was soluble and come into play with them. I actually don't fulfill his order. Finished play, suddenly I think there is a person who stands behind me. I turned, it turns out to be Rasulullah SAW and then he holds my shoulder. While smiling he said: "O Anas, whether you have done my request?" I feel guilty, and answer; "Alright, I go now." 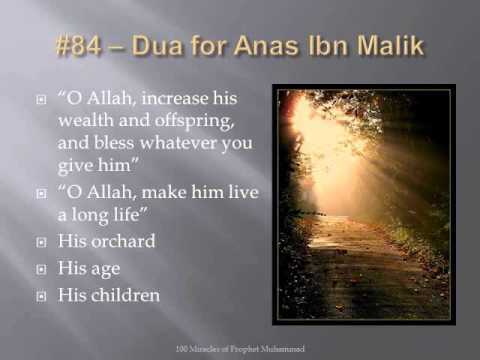 Anas bin Malik RA is Muslim who is godly, and obedient to an order of Rasulullah SAW. He did not fight in war of Badr, as he was still young. But Anas bin Malik follows other wars. Anas bin Malik RA participate in Yamamah’s war, where in this war he almost die when exposed to the latch from a hot iron thrown from the enemy fortification. 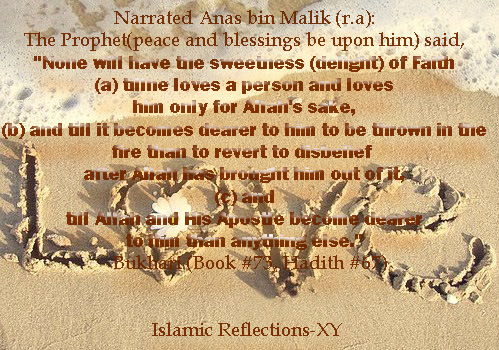 But by the permission of Allah SWT, Anas had been rescued by his own brother Baro bin Malik RA. He was a Mufti, Qari, Muhaddith and Islamic narrators. Anas bin Malik RA get a lots of knowledge from Rasulullah SAW, Saidina Abu Bakr RA, Saidina Umar Al Khattab RA, Saidina Uthman ibn Affan RA, Al-Hudair Mu’ad RA, Usaid, Abu Tholhah RA, his mother Ummu Sulaim RA, own aunt Ummu Haram RA and her husband Ubadah Ibn Abu Dharr RA, Shami RA, Malik bin Sha'sha'ah RA, Abu Hurairah RA, Fatimah Al Zarra RA and many more. Rasulullah SAW did pray for Anas Ibn Malik RA with prayer, "Allahumma Urzuqu Maalan WA Waladan WA Baarik Lahu” (O Allah, give him a wealth and offspring and bless his life)." Prayer of Rasulullah SAW was granted by Allah SWT and Anas was blessed with the age of up to 103 years. When Rasulullah SAW demised, Anas bin Malik RA still live up to eighty years later. Because of his long age, Anas Ibn Malik RA once said, "No one is left (from a companions of Rasulullah SAW) who can still pray at the mosque Qiblatain except me." Anas bin Malik RA is also endowed with a lot of descent, i.e. 100 children and their grandchildren. When has completed reading Qur'an, he gathered his wife and children and then pray. 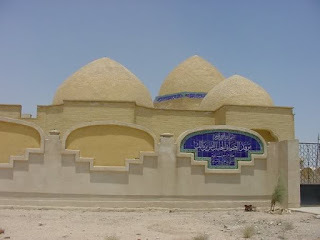 Anas bin Malik RA is also endowed with enough treasure, so he became one of the richest young men from among the Ansar. In the course of his life together with Rasulullah SAW for 10 years, Anas ibn Malik RA has been narrating of not less than 2286 hadith and is the third largest of companions of Rasulullah SAW in the hadith narrating. After the demised of Rasulullah SAW, Anas bin Malik RA went to Syam (Damascus- Syria). And from there he moved to Basra (Iraq). With the lessons he received from Rasulullah SAW, Anas Ibn Malik RA practice it in every places that he been to. After undergoing his life about one century, Anas ibn Malik RA died in 91 Hijrah year. 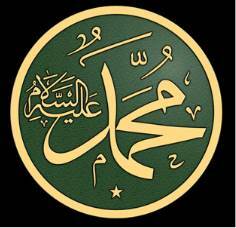 His last moments, he fell ill and he asked his family, "Teach me the phrase “Laa ilaaha illallah, Muhammadun Rasulullah." And he kept the reciting “Shahadah” sentence until the end of his life meeting his creator-Allah SWT. At the time of his demise, Muwarriq RA said, "Has been lost half the science of. If there are people who like follow their desires and disputing with us, then we said to him, let us facing to the person who have heard directly from of Rasulullah SAW." 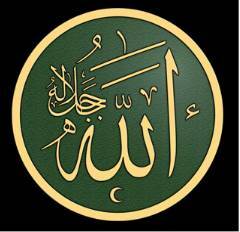 Anas ibn Malik RA is a maid of Rasulullah SAW which continuously loves Rasulullah SAW until the end of his life. Anas bin Malik RA is one of companions of Rasulullah SAW who fitly deserve to be an example. 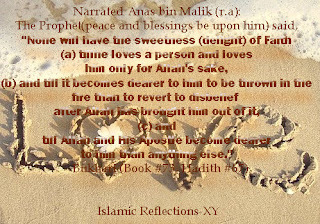 Anas bin Malik RA everlastingly desirous to meet of Rasulullah SAW moment in the afterlife. Anas bin Malik RA often said, "I hope can met of Rasulullah SAW on judgment day and i said to him: ‘O Rasulullah, this is your small helpmate, Unais.'" Listed below are only a portion of the Hadiths narrated by the helpmate of Rasulullah SAW, there are more than 2500 hadiths from Saidina Anas bin Malik RA. It was related to me from malik from Musa ibn Uqba from Abd ar-Rahman ibn Yazid al-Ansari that when anas ibn malik came back from Iraq, Abu Talha and Ubayy ibn Kab visited him. He brought them some cooked food and they ate, and then anas got up and did wudu. Abu Talha and Ubayy ibn Kab asked, "What's this, anas? Is it an Iraqi custom?" and anas said, "I wish I had not done it." (i.e. wudu). Abu Talha and Ubayy ibn Kab both got up and prayed without doing wudu. I heard Anas bin Malik saying, "A tailor invited Allah's Rasul SAW to a meal which he had prepared. " Anas bin Malik RA said, "I accompanied Allah's Apostle to that meal. He served Rasulullah SAW with bread and soup made with gourd and dried meat. I saw Rasulullah SAW taking the pieces of gourd from the dish." Anas RA added, "Since that day I have continued to like gourd." Once Musa bin anas while describing the battle of Yamama, said, "Anas bin Malik RA went to Thabit bin Qais, who had lifted his clothes from his thighs and was applying Hanut to his body. anas asked, 'O Uncle! What is holding you back (from the battle)?' He replied, 'O my nephew! I am coming just now,' and went on perfuming himself with Hanut, then he came and sat (in the row). anas then mentioned that the people fled from the battlefield. On that Thabit said, 'Clear the way for me to fight the enemy. We would never do so (i.e. flee) in the company of Allah's Apostle (SAW). How bad the habits you have acquired from your enemies!' "
Anas bin Malik RA said, "Rasulullah SAW and Zaid bin Thabit took their Suhur together. When they finished it, the Prophet stood for the (Fajr) prayer and offered it." We asked anas, "What was the interval between their finishing the Suhur and the starting of the morning prayer?" anas replied, "It was equal to the time taken by a person in reciting fifty verses of the Quran." anas said, "I do not find (now-a-days) things as they were (practiced) at the time of Rasulullah SAW." Somebody said "The prayer (is as it was.)" Anas bin Malik RA said, "Have you not done in the prayer what you have done? Narrated Az-Zuhri that he visited anas bin malik at Damascus and found him weeping and asked him why he was weeping. He replied, "I do not know anything which I used to know during the life-time of Allah's Apostle except this prayer which is being lost (not offered as it should be)." I offered the Friday prayer along with anas ibn malik. We were pushed to the pillars (due to the crowd of people). We, therefore, stopped forward and backward. Anas bin Malik RA then said: We used to avoid it (setting a row between the pillars) during the time of Rasulullah SAW. Yahya related to me from malik from Ibn Shihab that Anas bin Malik RA said, "We would pray asr and anyone who then went to Quba would arrive there while the sun was still high." Yahya related to me from malik from Sharik ibn Abdullah ibn Abi Namir that Anas bin Malik RA said, "A man came to Rasulullah SAW and said, 'O Rasulullah, our animals are dying and our camels are too weak to travel, so make dua to Allah.' Rasulullah SAW made dua, and it rained on us from one jumuah to the next." Anas bin Malik RA continued, "Then a man came to Rasulullah SAW, and said, 'O Rasulullah!, our houses have fallen down, the paths are blocked, and our flocks are dying.' Rasulullah SAW said, 'O Allah, (only) the mountain and hill-tops, the valley bottoms, and the places where trees grow.' " Anas bin Malik RA added, "It cleared away from Madinah like a garment being removed." Anas bin Malik RA said, about a man who missed the prayer of asking for rain but caught the khutbah, and wished to pray in the mosque, or in his house when he returned, "He is free to do so, or not, as he wishes." Yahya related to me from malik from Ishaq ibn Abdullah ibn Abi Talha that Anas bin Malik RA said, "We would pray asr and anyone who then went to the Bani Amr ibn Awf would find them praying asr." I asked Anas bin Malik RA while we were proceeding from Mina to 'Arafat, "What do you use to do on this day when you were with Allah's Rasul ?" Anas bin Malik RA said, "Some of us used to recite Talbiya and nobody objected to that, and others used to recite Takbir and nobody objected to that." Yahya related to me from Malik from Humayd at-Tawil that Anas bin Malik RA said, "A virgin has seven nights, and a woman who has been previously married has three nights." Malik affirmed, "That is what is done among us." Malik added, "If the man has another wife, he divides his time equally between them after the wedding nights. He does not count the wedding nights against the one he has just married." Anas bin Malik RA said, that once a domestic sheep was milked for Allah's Rasul (SAW) while he was in the house of Anas bin Malik RA. The milk was mixed with water drawn from the well in Anas's house. A tumbler of it was presented to Rasulullah SAW who drank from it. Then Saidina Abu Bakr RA was sitting on his left side and a bedouin on his right side. When Rasulullah SAW removed the tumbler from his mouth, 'Saidina Umar RA was afraid that Rasulullah SAW might give it to the bedouin, so he said. "O Rasulullah SAW! Give it to Abu Bakr who is sitting by your side." But Rasulullah SAW gave it to the bedouin, who was to his right and said, "You should start with the one on your right side." Yahya related to me from malik that Ishaq ibn Abdullah ibn Abi Talha said, "Anas bin Malik RA said, 'I saw Saidina Umar ibn al-Khattab RA when he was the Amir of Madinah. Three patches were sewn between his shoulders, one patched over the other.' "
Yahya related to me from Malik that he had heard that Anas bin Malik RA used to pay fidya when he had grown old and could no longer manage to do the fast. Malik said, "I do not consider that to do so is obligatory, but what I like most is that a man does the fast when he is strong enough. Whoever pays compensation gives one mudd of food in place of every day, using the mudd of Rasulullah SAW. Yahya related to me from malik from Humayd at-Tawil that Anas bin Malik RA said, "I stood behind Saidina Abu Bakr RA and Saidina Umar Al Khattab RA and Saidina Uthman bin Affan RA and none of them used to recite 'In the name of Allah, the Merciful, the Compassionate' when they began the prayer." While we were going from Mina to 'Arafat, I asked Anas bin Malik RA, about Talbiya, "How did you use to say Talbiya in the company of Rasulullah? "Anas bin Malik RA said: "People used to say Talbiya and their saying was not objected to and they used to say Takbir and that was not objected to either." I asked Anas bin Malik RA about the Qunut. Anas bin Malik RA replied, "Definitely it was (recited)". I asked, "Before bowing or after it?" Anas bin Malik RA replied, "Before bowing." I added, "So and so has told me that you had informed him that it had been after bowing." Anas bin Malik RA said, "He told an untruth (i.e. "was mistaken," according to the Hijazi dialect). Rasulullah SAW recited Qunut after bowing for a period of one month." Anas bin Malik RA added, "Rasulullah SAW sent about seventy men (who knew the Quran by heart) towards the pagans (of Najd) who were less than they in number and there was a peace treaty between them and Rasulullah SAW (but the Pagans broke the treaty and killed the seventy men). So Rasulullah SAW recited Qunut for a period of one month asking Allah to punish them." Yahya related to me from malik that Yahya ibn Said said, "I saw Anas bin Malik RA on a journey praying on a donkey facing away from the qibla. He did the raka'at and the sajda by motioning with his head, without putting his face on anything." Yahya related to me from malik from Ishaq ibn Abdullah ibn Abi Talha from Anas ibn Malik RA that his grandmother, Mulayka, invited Rasulullah SAW, for food and he ate some of it. Then Rasulullah SAW, :said, "Get up and I will lead you in prayer." Anas bin Malik RA said, "I stood up and took a woven mat belonging to us that had become black through long use and sprinkled it with water, and Rasulullah SAW , stood on it. The orphan and I formed a row behind him, and the old woman stood behind us. He prayed two rakaat with us and then left." I asked Anas bin Malik RA, "Tell me something you have observed about Rasulullah SAW concerning where he offered the Zuhr prayer on the Day of Tarwiya (8th Dhul-Hijja)." anas replied, "He offered it at Mina." I said, "Where did he offer the Asr prayer on the Day of Nafr (day of departure from Mina)?" He replied, "At Al-Abtah," and added, "You should do as your leaders do." Yahya related to me from Anas bin Malik RA from Ishaq ibn Abdullah ibn Abi Talha that Anas ibn Malik RA said, "I saw Rasulullah SAW, on one occasion when the asr prayer was at hand . Everyone was looking for water for wudu but no-one could find any. Then Rasulullah SAW , brought some water in a vessel . He put his hand into the vessel and then he told them all to do wudu from it." 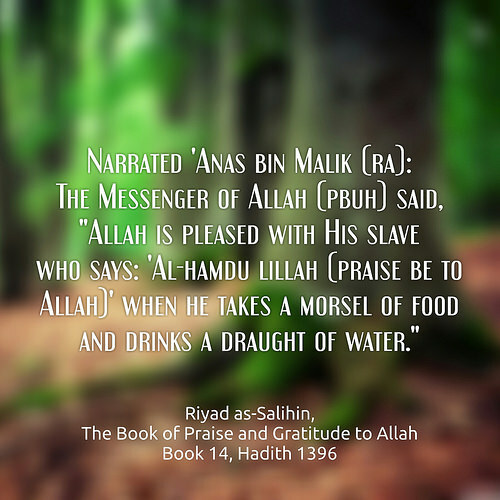 Anas Bin Malik RA added, "I saw water coming out from his fingers. Then all of them to the last man did wudu." 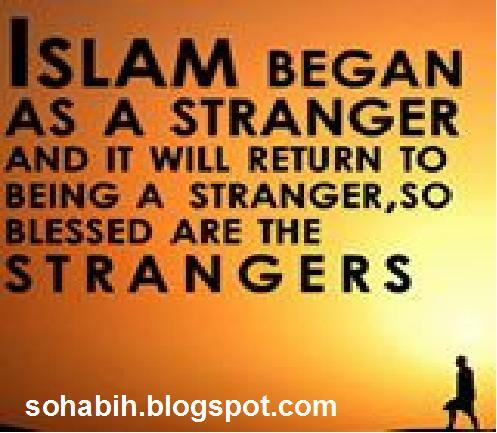 Yahya related to me from malik from Ibn Shihab from anas ibn malik that the Messenger of Allah, may Allah bless him and grant him peace, said, "Do not be angry with each other and do not envy each other and do not turn away from each other, and be slaves of Allah, brothers. It is not halal for a muslim to shun his brother for more than three nights." Ziyad related to me from malik from Humayd at-Tawil that 'Anas ibn Malik RA said, "Rasulullah SAW, came out to us in Ramadan and said, 'I was shown a certain night in Ramadan and then two men abused each other and it was taken away. Look for it on the ninth and the seventh and the fifth.' "
that he had heard anas b. malik narrating this. Yahya related to me from Anas bin Malik RA that Ishaq ibn Abdullah ibn Abi Talha heard anas ibn malik say that a certain tailor invited Rasulullah SAW, to eat some food which he had prepared. Anas Bin Malik RA said, "I went with the Messenger of Allah, may Allah bless him and grant him peace, to eat the food. He served barley bread and a soup with pumpkin in it. I saw Rasulullah SAW, going after the pumpkin around the dish, so I have always liked pumpkin since that day." Anas bin Malik RA said, "Rasulullah SAW and Zaid bin Thabit took the 'Suhur' together and after finishing the meal, the Prophet stood up and prayed (Fajr prayer)." I asked anas, "How long was the interval between finishing their 'Suhur' and starting the prayer?" He replied, "The interval between the two was just sufficient to recite fifty 'Ayat." (Verses of the Quran)." anas said, "Rasulullah SAW used to perform ablution for every prayer." I asked Anas bin Malik RA, "What you used to do?' anas replied, "We used to pray with the same ablution until we break it with Hadath." I heard Anas bin Malik RA saying, "On a Friday a person entered the main Mosque through the gate facing the pulpit while Rasulullah SAW was delivering the Khutbah. The man stood in front of Rasulullah SAW and said, 'O Rasulullah! !The livestock are dying and the roads are cut off; so please pray to Allah for rain.' " Anas bin Malik RA added, "Rasulullah SAW raised both his hands and said, 'O Allah! Bless us with rain! O Allah! Bless us with rain! O Allah! Bless us with rain!' " anas added, "By Allah, we could not see any trace of cloud in the sky and there was no building or a house between us and (the mountains of) Sila." Ans bin Malik RA added, "A heavy cloud like a shield appeared from behind it (i.e. Sila' Mountain). When it came in the middle of the sky, it spread and then rained." Anas bin Malik RA further said, "By Allah! We could not see the sun for a week. Next Friday a person entered through the same gate and at that time Rasulullah SAW was delivering the Friday's Khutbah. The man stood in front of him and said, 'O Rasulullah! The livestock are dying and the roads are cut off, please pray to Allah to with-hold rain.' " Anas bin Malik RA added, "Rasulullah SAW I raised both his hands and said, 'O Allah! Round about us and not on us. O Allah! On the plateaus, on the mountains, on the hills, in the valleys and on the places where trees grow.' So the rain stopped and we came out walking in the sun." Sharik asked Anas bin Malik RA whether it was the same person who had asked for the rain (the last Friday). Anas bin Malik RA replied that he did not know. Yahya related to me from malik from Ishaq ibn Abdullah ibn Abi Talha that Anas ibn Malik RA heard Umar ibn al-Khattab RA return the greeting of a man who greeted him. Then Saidina Umar RA asked the man, "How are you?" He said, "I praise Allah to you." (Ahmadu ilayka Allah) Saidina Umar Al Khattab RA said, "That is what I wanted from you." Found In: Imam Malik's Muwatta Chapter No: 49, The Description of Rasulullah SAW. Yahya related to me from Anas bin Malik RA from Ishaq ibn Abdullah ibn Abi Talha that Anas bin Malik RA said, "I saw Saidina Umar ibn al-Khattab RA when he was Amir al-Mukminin being given a sa of dates, and he ate all of them, even the inferior ones." Yahya related to me from Malik from Abdullah ibn Dinar RA that Abdullah ibn Umar RA said, ''Saidina Umar ibn al-Khattab RA was asked about locusts. He said, 'I would like to have a basket of them, from which we could eat.' "
Anas bin Malik RA related to me from Ishaq ibn Abdullah ibn Abi Talha that Anas bin Malik RA said, "I heard Saidina Umar ibn al-Khattab RA, when I was going out with him to visit an orchard, say to himself, and there was a wall between him and me and he was inside the garden, 'Saidina Umar ibn al-Khattab, Amir al-Mukminin! Well done! Well done! By Allah, fear Allah or he will punish you.' "
Yahya related to me from Anas bin Malik RA that Muhammad ibn Abi Bakr ath-Thaqafi once asked Anas bin Malik RA, while the two of them were going from Mina to Arafat, "What did you use to do on this day when you were with Rasulullah SAW?" He said, "Those of us who were saying the talbiya would continue doing so, and no-one disapproved of it, and those of us who were saying 'Allahu akbar' would continue doing so, and no-one disapproved of that either." that he heard Anas bin Malik RA say: "The Messenger of Allah (saw) used to accept the invitation of a slave." Anas bin Malik RA said, "My grand-mother Mulaika invited Allah's Rasul for a meal which she herself had prepared. He ate from it and said, 'Get up! I will lead you in the prayer.' " Anas bin Malik RA added, "I took my Hasir, washed it with water as it had become dark because of long use and Allah's Rasul stood on it. The orphan (Damira or Ruh) and I aligned behind him and the old lady (Mulaika) stood behind us. Allah's Rasul led us in the prayer and offered two Rak'at and then left." Yahya related to me from malik from Amr, the mawla of al-Muttalib from Anas bin Malik RA that Rasulullah SAW, saw Uhud and said, "This is a mountain which loves us and we love it. O Allah! Ibrahim made Makka Haram, and I will make what is between the two tracts of black stones (in Madinah) a Haram." Yahya related to me from malik from Ibn Shihab from anas ibn malik that Rasulullah SAW, was brought some milk which was mixed with well-water. There was a Bedouin at his right side and Abu Bakr as-Siddiq on his left. He drank and then gave it to the Bedouin and said, "The right-hand to the right-hand." Said bin Yazid Al-Azdi: I asked Anas bin Malik RA whether Rasulullah SAW had ever, prayed with his shoes on. He replied "Yes." Anas bin Malik RA was asked whether they disliked the cupping for a fasting person. He replied in the negative and said, "Only if it causes weakness." "I only know it from Anas bin Malik RA who said: 'No case involving retaliation was referred to Rasulullah SAW but he enjoined forgiveness." Yahya related to me from malik from Humayd at-Tawil that Anas ibn Malik RA said, "We once travelled with Rasulullah SAW, in Ramadan, and those who were fasting did not find fault with those who were not, and those who were not fasting did not find fault with those who were." Anas bin Malik RA said, "A person entered the Mosque on a Friday through the gate facing the Daril-Qada' and Allah's Rasul was standing delivering the Khutbah (sermon). The man stood in front of Rasulullah SAW and said, 'O Allah's Rasul, livestock are dying and the roads are cut off; please pray to Allah for rain.' So Rasulullah SAW raised both his hands and said, 'O Allah! Bless us with rain. O Allah! Bless us with rain. O Allah! Bless us with rain!" anas added, "By Allah, there were no clouds in the sky and there was no house or building between us and the mountain of Silas'. Then a big cloud like a shield appeared from behind it (i.e. Silas Mountain) and when it came in the middle of the sky, it spread and then rained. By Allah! We could not see the sun for a week. The next Friday, a person entered through the same gate and Allah's Rasul was delivering the Friday Khutbah and the man stood in front of him and said, 'O Allah's Apostle! The livestock are dying and the roads are cut off; Please pray to Allah to withhold rain.' " Anas bin Malik RA added, "Allah's Rasul raised both his hands and said, 'O Allah! Round about us and not on us. O Allah!' On the plateaus, on the mountains, on the hills, in the valleys and on the places where trees grow.' " anas added, "The rain stopped and we came out, walking in the sun." Sharik asked Anas bin Malik RA whether it was the same person who had asked for rain the previous Friday.Anas bin Malik RA replied that he did not know. Anas bin Malik RA said, "Rasulullah SAW asked for water and a tumbler with a broad base and no so deep, containing a small quantity of water, was brought to him whereby he put his fingers in it." anas further said, ' noticed the water springing out from amongst his fingers." anas added, ' estimated that the people who performed ablution with it numbered between seventy to eighty." Yahya related to me from malik from Ishaq ibn Abdullah ibn Abi Talha that Anas ibn Malik RA said, "I was serving wine to Abu Ubayda ibn al-Jarrah and Abu Talha al-Ansari and Umayy ibn Kab. The wine had been prepared from crushed ripe dates and dried dates. Someone came to them and said, 'Wine has been made haram.' Abu Talha ordered me to go and take the jugs and break them. I stood up and went to a mortar of ours and I struck them with the bottom of it until they broke." Yahya related to me from malik from Ibn Shihab from anas ibn malik that the Rasulullah SAW, may Allah bless him and grant him peace, entered Makka, in the Year of Victory, wearing a helmet, and when he took it off a man came to him and said, "Rasulullah SAW, Ibn Khatal is clinging to the covers of the Kaba,'' and the Rasulullah SAW, said, "Kill him. "Malik commented, "The Rasulullah SAW, was not in ihram at the time, and Allah knows best." Anas bin Malik RA said, "When the emigrants came Madinah, they had nothing whereas the Ansar had land and property. The Ansar gave them their land on condition that the emigrants would give them half the yearly yield and work on the land and provide the necessaries for cultivation." His (i.e. anas's mother who was also the mother of A'bdullah bin Abu Talha, gave some date-palms to Allah' Apostle (SAW) who gave them to his freed slave-girl (Um Aiman) who was also the mother of Usama bin Zaid. When Rasulullah SAW finished from the fighting against the people of Khaibar and returned to Medina, the emigrants returned to the Ansar the fruit gifts which the Ansar had given them. Rasulullah SAW also returned to Anas's mother the date-palms. Rasulullah SAW gave Um Aiman other trees from his garden in lieu of the old gift. that Anas bin Malik RA said: We were forbidden in the Holy Qur'an that we should ask about anything from Rasulullah SAW and then Anas bin Malik RA reported the hadith in similar words. from Ali bin Zaid bin Judan from Anas bin Malik RA who said: "I attended a wedding feast for Rasulullah SAW in which there was no meat and no bread." Yahya related to me from malik that Ishaq ibn Abdullah ibn Abi Talha heard anas ibn malik say that Abu Talha had said to Umm Sulaym, "I have just been listening to Rasulullah SAW, may Allah bless him and grant him peace, and his voice was very weak. I recognised hunger in it, so, do you have anything?" She replied, "Yes," and brought out some barley loaves. She took her long head scarf and wrapped up the bread with part of it and put it into my (Anas Bin Malik RA) hand and gave me part of it to wear. Then she sent me to Rasulullah SAW, may Allah bless him and grant him peace." anas continued, "I took it, and I found the Messenger of Allah, may Allah bless him and grant him peace, sitting in the mosque with some people. I watched them. Rasulullah SAW, may Allah bless him and grant him peace, said, 'Did Abu Talha send you?' I replied, 'Yes.' He said, 'For food?' I said, 'Yes.' Rasulullah SAW, may Allah bless him and grant him peace, said to those with him, 'Let us go.' He set off and I went among them until I came to Abu Talha and told him. Abu Talha said, 'Umm Sulaym! Rasulullah SAW, may Allah bless him and grant him peace, has brought people and we have no food. What shall we give them to eat?' She said, Rasulullah SAW know best.' " Anas continued, "Abu Talha went out and met Rasulullah SAW, may Allah bless him and grant him peace, and Rasulullah SAW, may Allah bless him and grant him peace, approached with Abu Talha until they entered. Rasulullah SAW, said, 'Come now, Umm Sulaym, what have you got?' She brought out bread. Rasulullah SAW, ordered it to be broken into pieces, and Umm Sulaym squeezed out onto it a container of clarified butter which she had seasoned. 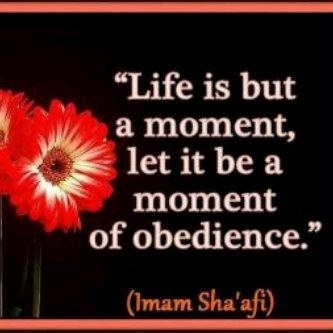 Rasulullah SAW said whatever Allah wished him to say, and said, 'Will you give permission for ten of them to come in?' He gave them permission, and they ate until they were full and then left. He said, 'Give permission to ten more.' He gave them permission, and they ate until they were full and left. Then he said, 'Give permission to ten more.' He gave them permission and they ate until they were full and left. Then he said, 'Give permission to ten more.' He gave permission and they ate until they were full and left. There were seventy or eighty men." I asked Anas b. Malik RA about ablution. He replied: Rasulullah SAW performed ablution for each prayer and we offered (many) prayers with the same ablution. French Cool!! A new young Anas Malik from Romania.